What’s the most valuable pick in a fantasy football draft? Is it a first-rounder that doesn’t bust? A steady WR1 in the third? Well, all of that factors into the recipe of your common title squad. But check the roster of that league mate who edged you last year, and you’re likely to find at least a player or two who drastically outperformed his draft position. Sure, it helps if your top pick delivers, but at least half your league is probably also getting big points from a first-round selection. Your edge will come from knowing a group of players in the middle-to-late rounds with the upside to turn into key starters that fuel your championship run. Hey, this is a Wisconsin site. So I might as well put the candy right up front. If you know how Green Bay will split the work between Jones and Williams, then please let me know. I sure don’t. That’s certainly not stopping us from projecting both players over on DraftSharks.com. But this backfield battle is likely to come down more to coaches’ preference and summer performance more than any advanced metric you can glean from their shared rookie season. I’m not ready as of this writing to crown either guy the better 2018 fantasy football selection. Fortunately, I don’t have to. Jones is going 35th among RBs in MFL10 drafts since May 15, in the second half of Round 7 on average. Williams is going 40th, late in Round 8. That means you can draft them both and see what happens. 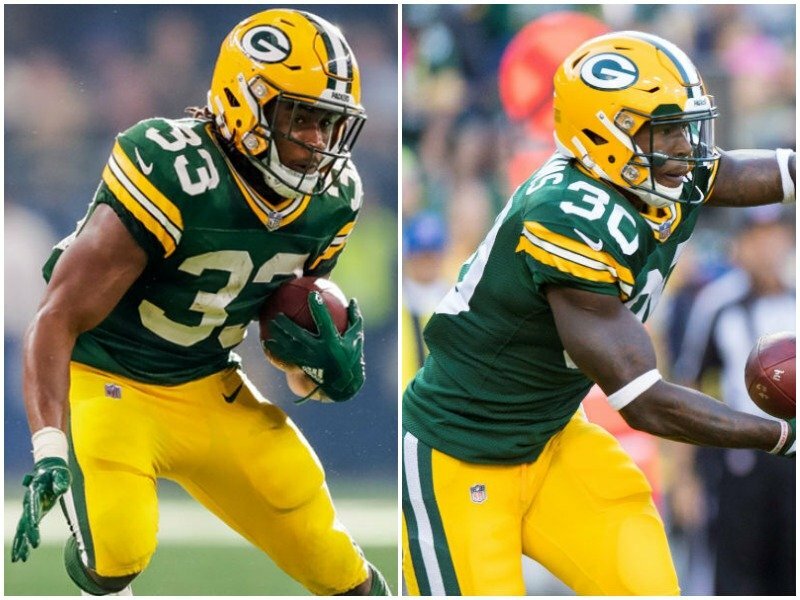 The Packers split RB touches among these two rookies and a converted wideout last year, and they delivered six top-8 fantasy weeks at the position. Only six teams beat that number, and all six have RBs currently sitting among the top 16 overall in ADP. Just like in Green Bay, we don’t yet know exactly how Titans coaches plan to split the work between Lewis and Derrick Henry. Here’s what we do know: The new coaching staff (as of this offseason) did not draft Henry. It did let DeMarco Murray walk … and then signed the most expensive free-agent RB right when the market opened. Yet stubborn fantasy owners continue to draft Henry at least a round ahead of Lewis. You might look at Lewis’ size and see “change of pace,” but that’s outdated thinking. Most NFL backfields no longer follow the old setup of big bruiser on first and second down then pass-catcher on third. Beyond that, Lewis ran the ball pretty freakin’ well in 2017. Football Outsiders rated him first and second league wide in their two main rushing-efficiency metrics. Pro Football Focus graded Lewis fifth-best overall at the position for the season. As for fantasy numbers, Lewis ranked seventh among RBs across formats from Week 6 on. Unsettled backfields can be scary for fantasy owners, but that fear can also present opportunity. Marlon Mack is likely to lead Indy in carries this season. Veteran Robert Turbin remains in the mix. And rookie Jordan Wilkins will probably factor in as well. But Hines has already begun carving out a significant role through OTAs and should benefit from a skill set unique among the group. He spent much of his first two seasons at wideout — including a 43-catch sophomore year — before posting a first-team All-ACC campaign in the backfield last season in his first starting shot at RB. Hines will likely be late-round fodder in your drafts but could crack the Colts’ top 4 in targets as a rookie. Is it a cop out to not singly out any Miami receiver here? No. Because I think at least three of them will make sense at various points in your draft. Jarvis Landry’s departure takes a player who has dominated targets over the past three seasons. He averaged 153 of them over that span and gobbled up 26.7% of the team share last year alone. DeVante Parker’s the top bet to lead the Landry-less Dolphins in looks this season. He might have burned you at some point over the past two years, but you’re not alone. Those burns have Parker’s ADP outside the top 40 among receivers. So you can take a shot at just a low-WR3 or even WR4 cost. That doesn’t even qualify as a gamble. And if you just can’t get over Parker, then there’s Kenny Stills. All he did was crack the top 26 across fantasy formats last year — with Landry and Parker both around. It was Stills’ second straight top-28 finish in non-PPR. Even later, you can find Albert Wilson, the guy Miami guaranteed $14.45 million on a three-year deal right after trading Landry. Perhaps Wilson doesn’t develop into anything more than the limited slot presence he was for the Chiefs. But in the final 2-3 rounds of your draft, you lose nothing by taking a flier. Right, Matt. I’m gonna win my league by investing in some dude who played 10 games the past two years. Well, voice in my head, it’s a lot like the Parker case. If Eifert were coming off the board by Round 5, like the top TE candidates, then I’d agree. No thanks. But he’s TE14 in ADP at the moment (if you remove Hunter Henry). You can pick that guy up as your No. 2. Whether you do that or take Eifert as part of a platoon, you’ll be getting a player who scored TDs on 21.8% of his receptions over the past three years. By comparison, Rob Gronkowski has reached that rate just once in eight seasons (as a 2010 rookie) and has scored on 16.0% of his career catches. Eifert ranked third on the team in targets last time he played at least 10 games (13 in 2015) and should return to at least that level if healthy in 2018. He was, at least, participating in OTAs after last year’s back surgery. This one’s pretty easy. Winston finished his first two seasons 13th and 10th among QBs in fantasy points. He ranked 13th in points per game last year, when a shoulder injury cost him three games. He’s now sitting 18th among QBs in ADP. Winston’s 2017 points per game climb into the position’s top 8 if you take out the two contests he left early. And his upside climbs if he and DeSean Jackson can use a second offseason together plus Winston’s improved health to hit on a few more of their downfield chances. Jackson posted career lows in yards per catch and per game in his first Bucs season. Winston is a QB1 that you can draft well into QB2 range. Matt Schauf covers offense and IDPs for the team at DraftSharks.com. Prepare for your fantasy football drafts with the free DS mock draft tool and check out the weekly podcasts for more advice.